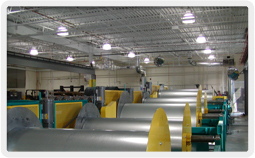 Superior Sheet Metal operates from a 25,000 sq. 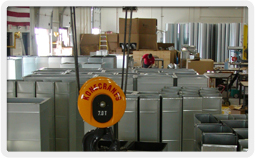 ft. state-of-the-art facility conveniently located just off the highway in Hudson, New Hampshire. 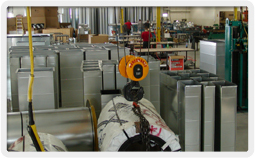 An Iowa Precision 6’ coil line will cut and form all rectangular straight duct, 4’, 5’, and 6’ lengths, of all materials quickly and accurately, insulated or not. 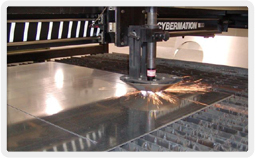 Three Plasma cutting tables speed along all of our fitting fabrication. Two of these are computer linked together, creating a faster, more efficient cutting table with no down time for loading and unloading. We keep the third machine available to fabricate specialty items and those ‘last minute, need it now’ fittings without disrupting normal production schedules. Our plasma tables are computer linked to an Iowa Precision Water-Jet liner cutter. This table will automatically and simultaneously cut all types of liner to fit the fittings being burned on the plasma tables - a perfect fit every time. 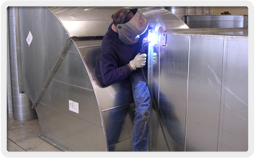 Our spiral duct and fittings are fabricated using modern Spiral Helix equipment, with capabilities from 3” to 50” in diameter, in all materials. 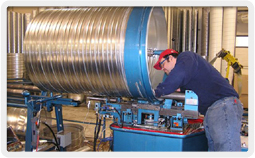 Spiral pipe may also be ‘corrugated’ for both visual effect and added strength. 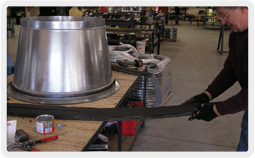 Smaller fittings are generally stitch welded for a cleaner, more uniform seam.